Unique gender reveal ideas: Couple uses alligator and jello! Watch this couple's hair-raising gender reveal — with an alligator! 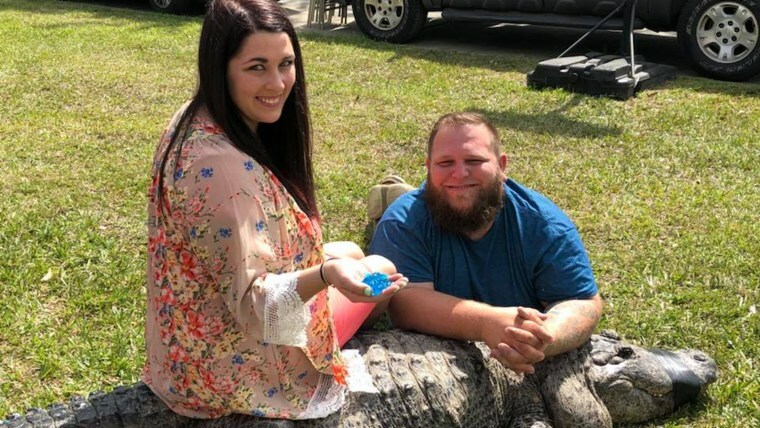 Mike "T-Mike" Kliebert and Rebecca Miller just took the gender-reveal trend to a heart-stopping new level — with the help of an alligator instead of the usual cake or confetti. The trained alligator handlers from Ponchatoula, Louisiana, couldn't think of a better way to personalize the special moment. "Being that alligators are part of our family, we wanted to include them in our gender reveal," Kliebert, 33, told TODAY. In the video, Kliebert places a hollowed-out watermelon into the alligator's mouth. When the reptile bites down on the fruit, blueberry Jell-O sprays out, indicating the couple is expecting a boy. While Miller, 24, had been hoping for a girl, Kliebert said he is thrilled with the result. In fact, he paused before putting the watermelon in the alligator's mouth to pray for a boy. They plan to name the baby, due in late July, River Joseph Daniel Kliebert. Kliebert's mom, Melody, posted the video to Facebook on March 25. "Just found out my grand baby is a ,,,,,,gotta love it!! And I do !! No matter the results !!" she wrote. In planning the event, Kliebert said they "didn't want to use just any alligator." The couple chose Sally, a 60-year-old gator hatched by Kliebert's grandfather back in 1957. According to Kliebert, Sally responds to her name and can understand color signals and basic commands. The video, which has been viewed more than 6 million times on Facebook alone, has received mixed reviews on social media. Some people have expressed concern for the family's safety, but Kliebert assured TODAY that the couple carefully planned the reveal to ensure everyone remained safe. "People seem to think the gator was going toward my son when he was on the ground, but that's not the case," he said. "I understand the animal, and I understand what they're capable of and I respect them." Additionally, many of those who attended the event work as professional alligator wranglers at the Kliebert family business, Kliebert Gator Tours, where they have a sanctuary containing 200 to 300 alligators. Kliebert is already counting down the days until his future son is old enough to start wrangling gators himself!